Wednesday, November 06, at 4 p.m. 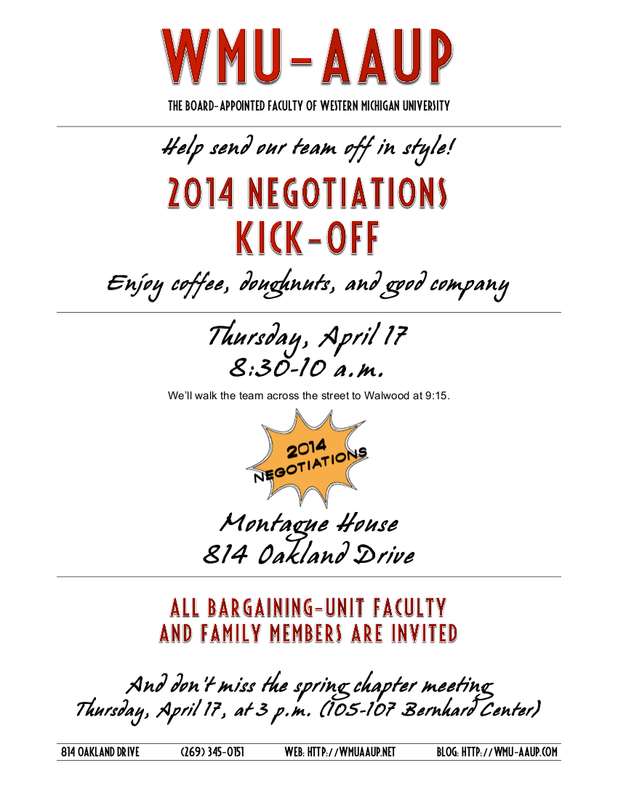 The WMU-AAUP contract campaign requires us to be strong and united as we prepare for what are likely to be contentious negotiations in 2014. Dr. Warren will highlight episodes from American labor history as examples of how unions have rallied and built solidarity in trying times in the past and how those experiences can work as models for effective organizing in the present and future. Wednesday, October 16, 2013, at 4 p.m. The so-called “Right-to-Work” legislation pushed through the Michigan legislature last December obliges all of us to reassess how we move forward and preserve workplace rights in what is becoming an increasingly hostile environment for workers nationwide. Labor expert John P. Beck will address issues associated with the new legislation and discuss ways we can respond to the challenges it presents as well as build our strength and capitalize on our opportunities. 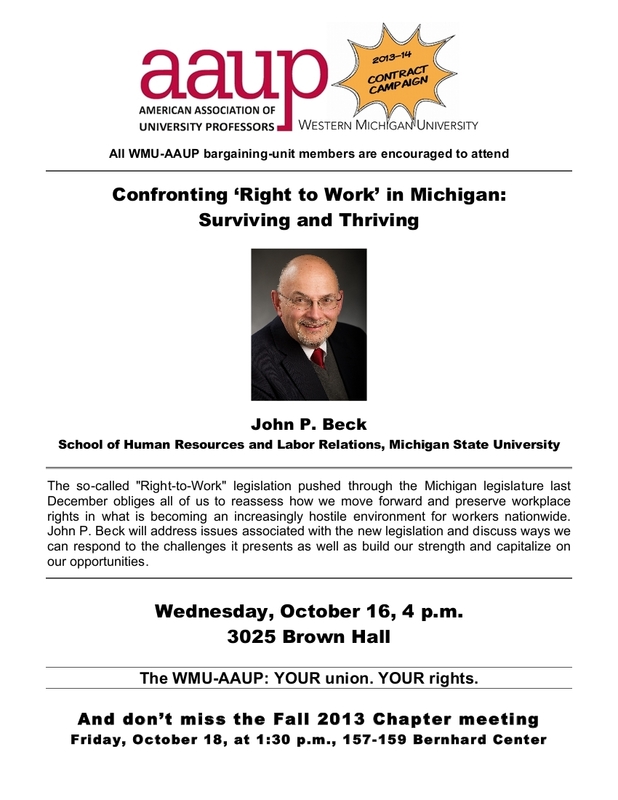 John P. Beck is Associate Professor in the School of Human Resources and Labor Relations at Michigan State University. He recently stepped down after ten years as associate director of the School, where he was primarily in charge of its efforts in the areas of labor, employment, and workplace education. He has taught a variety of courses in union leadership across and beyond the state of Michigan and university courses in labor studies and history. As MSU Museum adjunct curator, he co-directs (with Kurt Dewhurst) the “Our Daily Work, Our Daily Lives” program, which explores the culture of workers and the workplace. Before joining the faculty at MSU, John served as the Education and Research Director of the United Paperworkers International Union. He has earned degrees from Michigan State University and the University of Michigan and worked for five years at the University of Michigan Labor Studies Center. Our 2013-14 contract campaign starts now! Printer-friendly (pdf) Fall 2013 campaign flier and calendar of events here. Thanks to the new “right-to-work” laws in Michigan, a slow economic recovery, a political climate that is increasingly unsupportive of public education, and a legislative agenda dictated by well-financed organizations with corporatization on their minds, WMU faculty are facing new and unique challenges as we approach our 2014 negotiations. That is why the WMU-AAUP is working on a year-long campaign of events and actions to build solidarity on campus and support for 2014 negotiations. Check out the campaign calendar to see some of what’s in store this fall. A contract campaign engages the faculty to build strength and solidarity in advance of and during negotiations and supports the negotiation team. An effective campaign is one in which the faculty is visible, vocal, and united. It sends a powerful message that we have no intention of assuming a submissive posture in our negotiations and makes clear that we are determined to stand up for the values of academic excellence over political expediency. It would be great if once the faculty has won a benefit, we could consider it permanent from that point forward. Unfortunately, that is rarely the case. A benefit won by the faculty one year is often in the administration’s crosshairs the next time we’re at the table. The administration comes into every negotiation demanding concessions, and our considerable success over the years in holding them off is a direct result of the collective action of the faculty. In other words, our ability to win at the table depends on the visible and vocal support of the faculty. We owe it to the colleagues who founded our union, who have led the Chapter in the years since, and who have negotiated our contracts, fought for good salaries and healthcare, defended academic freedom, insisted on shared governance and due process, and refused to allow administrative fiat to be “the Western way.” We owe it to them – and to ourselves – not to allow their work to be undone. Join us at campaign events and encourage your colleagues to do the same. 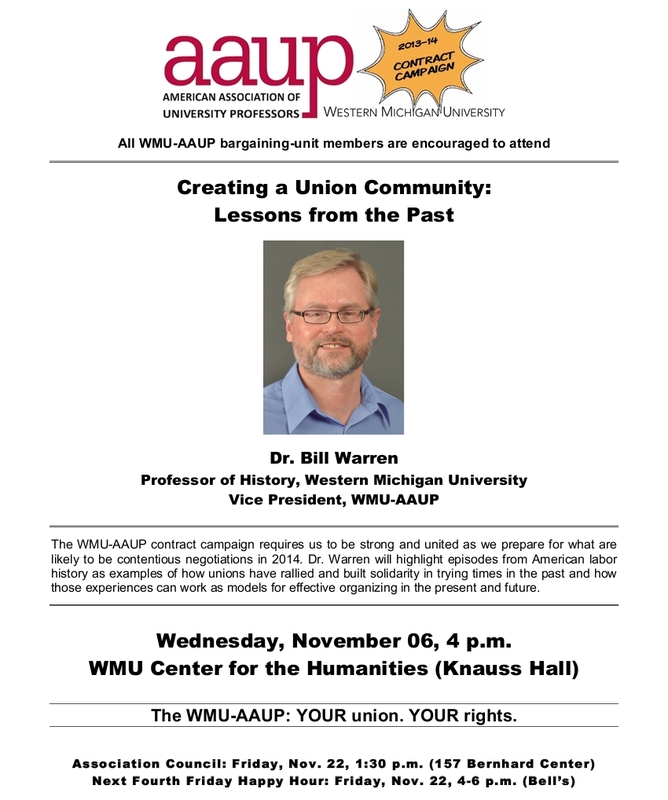 Watch for emails from the WMU-AAUP. Subscribe to this blog (see sidebar on the homepage). Call us (345-0151) or email us to join the campaign team. 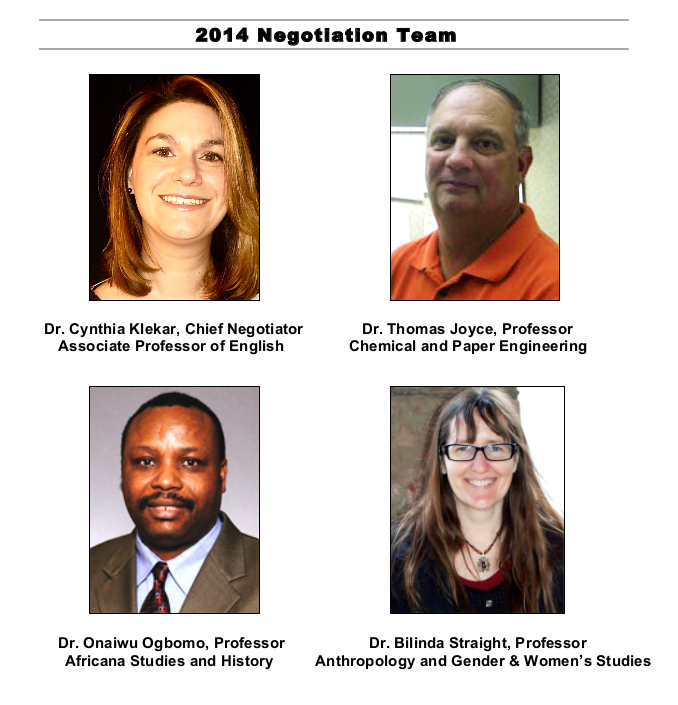 Answer the call for nominations for the 2014 negotiation team THIS FALL. Get ready to get active! Our strength is in our numbers. The AAUP national organization has appointed Julie Schmid its new executive director, effective October 2013. Julie comes to the AAUP from AFT-Wisconsin, where she has worked since 2008 and served as chief of staff since 2012. She brings to her new post extensive experience in higher education, collective bargaining, and the legislative issues that affect both, experience that includes serving on the front lines of defense against the legislative attacks on public-sector collective bargaining in Wisconsin in 2011. As senior program officer in the AAUP’s Department of Organizing and Services (2002 to 2008), Julie helped to lead the successful organization of faculty bargaining units at Michigan Tech and the University of Akron. In 2008, she became the director of AFT-Wisconsin, and in that role she was instrumental in the campaign to unionize the faculty and staff of the University of Wisconsin system. Julie rejoins the AAUP at a critical time and is uniquely poised to understand the challenges faced by bargaining-unit chapters like ours. At a time when Gov. Rick Snyder and the state legislature seem bent on bringing the Scott Walker agenda to Michigan — an agenda designed to decimate public-sector unions (and the middle class), dictated largely by ALEC (which has already been busy here in Michigan) and pushed by organizations like the Mackinac Center that are funded heavily by the Koch brothers and the DeVos family — Julie’s appointment is good news for such chapters, many of which have been frustrated in recent years by the national organization’s apparent lack of interest in supporting the collective-bargaining work on our campuses or helping us stand up to legislative overreach. I am excited to serve as the AAUP’s executive director because this is where the fight is. US higher education is in crisis. We are four decades into a radical defunding of state institutions of higher education. Faculty salaries are stagnant, while students are asked to pay more and more for their education. The overuse and exploitation of contingent faculty and graduate student employees continues. Academic freedom is under attack, and faculty senates have seen their voices diminished—sometimes because of administrative overreach and sometimes because the faculty has not exercised the power it has. And collective bargaining—which in many instances has proven to be an important means for bettering the working conditions of faculty members and academic professionals and for maintaining academic quality—is now under attack. The AAUP is the conscience of the profession. For nearly a century, the AAUP has defined professional standards for higher education and vigorously defended those standards when they have come under attack. And for nearly half that time, the AAUP has epitomized faculty unionism by organizing strong collective bargaining chapters and by enshrining AAUP principles and policies in collective bargaining agreements. You can read the statement in its entirety here and learn more about Julie here. 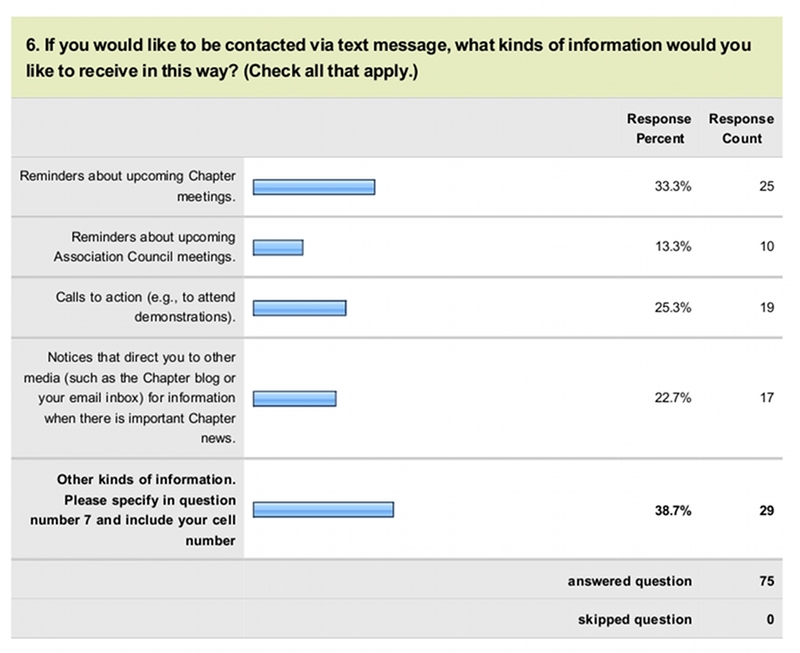 So far, 75 members have participated in the WMU-AAUP’s informal online survey of the faculty about their priorities for discussion at this week’s Chapter meeting (and over the longer term) and about their communication preferences. Thank you to all who managed to carve out some time to participate in the survey in the midst of your many responsibilities and obligations, especially at this hectic time of year. Our goal is to continue to work as hard as we can on your behalf, to respond to your concerns, and to find new ways to make your membership in the WMU-AAUP more meaningful, useful, and relevant to you. Your participation in the survey, and the ideas, suggestions, and feedback you share with us in other ways, are extremely helpful and valuable to us. And your willingness to collaborate with us in this way is very much appreciated. We are all stronger when we work together. We hope to see you at the last Chapter meeting of the academic year, which is tomorrow, Friday, April 19, at 1:30 p.m., in rooms 157-159 of the Bernhard Center. Now, without further ado, please read on for the survey results! 2. Are there any topics not listed above that you would like to see added to the Chapter meeting agenda? Equity, including gender equity, but also disciplinary and time-in-service equity (i.e., salary compression and inversion). How to keep current faculty engaged in the WMU-AAUP and develop outreach program for new hires. Increasing reliance on contingent faculty and overall loss of tenure lines campus-wide. Disparity in health insurance costs compared to other employee groups on campus? Q3. Thinking longer term, what do you feel are the most pressing issues in your professional life? 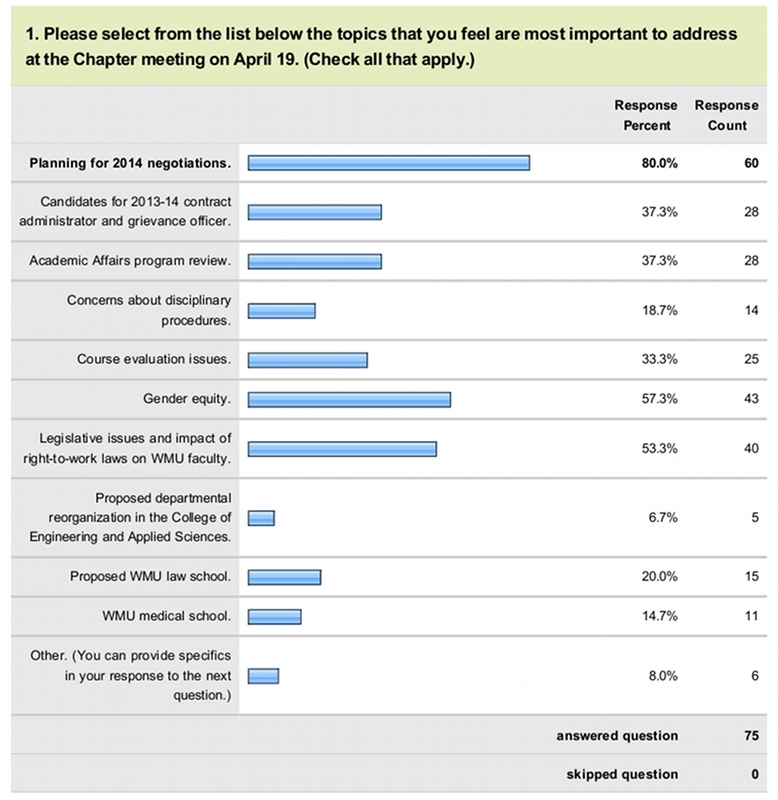 In other words, what are the issues that you believe the WMU-AAUP ought to address on your behalf as we go forward ? Other salary-equity issues, including compression and inversion. Below-market salaries of WMU faculty, stagnating wages, and increasing faculty costs. Loss of faculty lines campus-wide, inadequate staffing of academic programs. Workload, including unequal distributions of work within and across departments and colleges and significant increases in demands on faculty time. Lack of opportunities for merit increases. Unreasonable limitations on faculty use of sick leave to care for children; issues with annual leave for faculty on 12-month contracts. Corporate versus intellectual values driving the institutional agenda; “creeping expansionism” at the expense of core values. WMU fundraising efforts and resources diverted to medical school. Administrative overreach that compromises academic freedom and shared governance. Problems with evenhandedness and adherence to the contract in tenure and promotion review processes. Faculty relationship with legislature, organizing ourselves and defending WMU against inappropriate legislative interference, apparent administrative willingness to accept legislative micromanagement (in contravention of state constitution). Questions about use of assessment data in tenure and promotion decisions. Administrative priorities and inequitable distribution of resources across colleges and departments. Widespread lack of knowledge about and adherence to the contract on the parts of administrators as well as faculty. Ongoing denial of salary minima to language specialists. Permanent rather than year-by-year funding of the WMU Center for the Humanities. Evaluation of administrators in addition to the provost. 5. 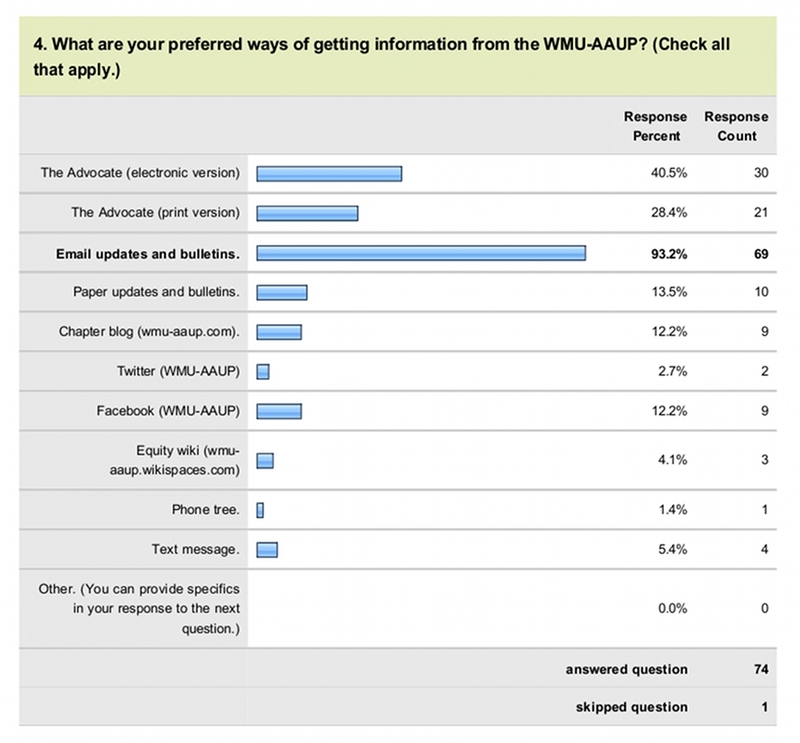 Are there other ways you would like to be kept informed by the WMU-AAUP, in addition to (or as alternatives to) the communication options listed in question #4? Don’t like getting both email and paper versions of communications; paper version should be discontinued. Concerned that Association Council representatives may not be attending meetings regularly or sharing information with department colleagues. Would like more frequent meetings. Would like copies of approved minutes sent to all Chapter members. 7. If you would like to be contacted via text message, please type the phone number to which you would like for us to direct our messages to you. 8. What are your ideas or suggestions for how the WMU-AAUP can be more effective on your behalf and/or how we can help make your membership more useful, meaningful, and relevant to you? Keep focusing on gender equity. Attention to the variety of workload issues on our campus. Work toward all manner of equity: gender, ethnic/racial, disciplinary, teaching loads, service loads, distribution of resources, awarding of sabbaticals, etc. Stand up to Lansing. Work for change of personnel in the legislature and against governor’s re-election. Work with other institutions across Michigan to protect higher education as a public good and fend off political encroachment. Fight hard on compensation in 2014. Need a campus-wide conversation on salary compression and inversion. More meetings with different groups of faculty, including Chapter meetings and Association Council meetings, but also meetings with faculty in various colleges and departments and/or in issue-driven groups, to talk about union issues. Communicate actively and frequently with faculty. Provide lots of updates. Make sure officers keep consistent office hours. As we get ready for RTW at WMU once our current contract expires in September 2014, focus on faculty outreach, including regular surveys, marketing/PR campaigns, social events, community-building opportunities, and highlighting of member services and their value. 9. Are you interested in serving in a leadership position in the WMU-AAUP?